Following on from the Outline Planning Permission for mixed-use development on the Harbury Depot Site, Influence were appointed to work with the architects to design the outdoor space for the proposed Doctors’ Surgery. 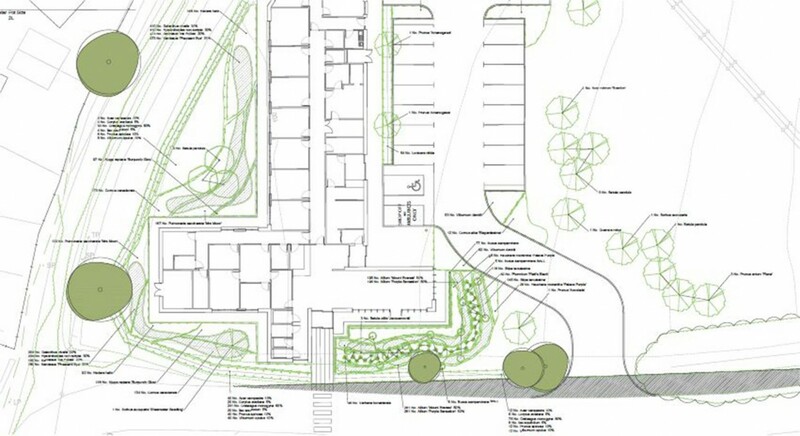 The planting proposals were developed to create individual spaces around the building, which respond to the purpose and appearance of the building and relate to the treed setting. Plant species were selected to provide year round interest, to fulfil the specific design intentions, to be appropriate to this location, to require minimal maintenance and ensure that planting remains neat and tidy throughout the year. Planting within the small, formal garden at the entrance to the building responds to the patients’ senses through colour, movement and resulting sounds of plants and trees within the space. A private, shady garden at the rear of the building provides visual interest for the consultants and patients in the overlooking rooms. It is a secluded space containing woodland planting with a carpet of ground cover plants and bulb planting to provide a year round colour palette of calming whites, blues and varigated greens. Our planting palette responds to the functional space, whilst softening the edges of the necessary hardscape areas around the built form.